It is difficult to get a handle on what exactly is happening in our troubled economy. Everyone feels the malaise but few know how to explain it. Some say the economy is getting slightly better; others say it is getting much worse. There is debt, unemployment and stagnation which some say is caused by too much government and others say comes from too little. A constant stream of messages, statements and generalizations leave the normal reader struggling to keep up. In the rush, we are often reduced to basing opinions on what can be gleaned from Internet headlines. These are dangerous times because economy is ruled today much more by the way it is perceived by the general public rather than the actual facts. It is becoming increasingly difficult to disregard the distorting hype of the media. 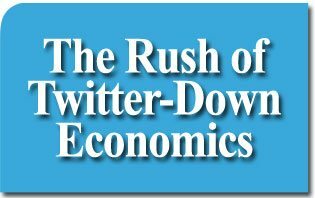 Indeed, what passes for economics these days is not trickle-down but twitter-down economics. In the nano-second rush of twitter-down economics, everyone grabs the part of the message they like so that it might be instantly posted. No one has time for explanations beyond those which can be texted. So much of what people believe is based on sound bytes designed to cause momentary sensations and emotional impressions. Anything vague or ambiguous can be, and is, tweeted into streams of confusing 140-character messages that cloud minds. The economic message becomes what you want it to be or even nothing at all. All this is the result of what I call the “frenetic intemperance” of our times. We live in days of moral unrestraint and instant gratification. Everyone must have everything now, instantly and without effort or reflection. This gives rise to a whirlwind of activity that has long been tearing our economy and society apart. It even erodes our Faith. At the same time, it is breaking down economic thought since so much is based upon the instant and ephemeral. There is the general questioning of all that is reasoned or structured. With the ever more frantic pace of today’s world, our economy is now at risk. Instead of relevant and serious economic discussion, we are seeing a fragmented postmodern mix of ideas where everything is possible and nothing is certain. There is actually little new in the economic debate. What is new is the chaotic mixture of old rich v. poor narratives, recycled Keynesian nonsense, and impossible entitlement demands. There are distortions of free market ideas (such as the so-called trickle-down economics). There are socialist diatribes and leftover scraps from the Occupy Wall Street propaganda of the one percent. This tired and confusing mixture permeates everything and conveys the message that “capitalism” (whatever that means) has failed and we need to look elsewhere for solutions. What is particularly dangerous about twitter-down economy is that policy becomes based on impressions that remain in the general public consciousness in the midst of this chaos. Reality risks being disregarded or contradicted. Our guiding principles are jettisoned. We head toward the coming economic storm rudderless, unaware of the real dangers that lurk ahead. There are those who claim that the debate be carried out in this manner since a postmodern world should be addressed in postmodern terms. Such a policy only multiplies the confusion. There is really one way to deal with these matters in the rush of twitter-down economics. It involves denouncing the whirlwind of frenetic intemperance that fuels the superficial and ambiguous debates that swirl about. At the same time, it is not enough to counter with a twitter-down defense of the free market or modern financial systems. We must return to the foundations of sound economy. This calls for reconnecting with the moral considerations and restraints that need to guide our economic actions and keep them balanced. In short, we need a change in the dialectic that governs the debates now raging in face of the present economic crisis. Far from the tyranny of the 140-character tweet, we need to give postmodern man that for which he yearns: a categorical message presented with extreme clarity, logic and precision. There must be a return to order. This is what I have endeavored to do in the book, Return to Order. I have sought to clearly articulate what constitutes sound economy and its necessary connection to moral law. It is a daring proposal since it is grounded on an understanding of reality long abandoned. Indeed, ever since economic thought broke free from its moorings in moral philosophy and ethics, there have been those who have sought to keep such considerations out of this debate. The time has come for such reflections to return. They must return not out of convenience but rather of urgent necessity. We are entering dangerous waters. Without a framework of clear principles to serve as beacon, we risk becoming wrecked upon the rocky shoals.